This weekend up in the family cabin in Maine I volunteered to cook for my in-laws. The last time we were there, my husband's cousins were also visiting and my cousin Mikki and my mother-in-law did all the cooking while I sat back and enjoyed the spoils. I also enjoy cooking, and in the interest of proving that I'm not a princess expecting to be served all the time, I figured it was my turn to seize the wooden spoon. I've been curious to try some of his recipes. I'm not a vegetarian, but Mike is, and it wouldn't hurt for me to incorporate more vegetables into my starch and sugar diet. What I didn't remember about Brown's way of cooking was 1. he takes his time cooking, communing with the ingredients, which five years ago would have made me roll my eyes and dismiss him as a New Age weirdo, but now I think it's interesting. I find that when I'm in the zone, cooking can be very Zen-like. Oh, and 2. his menus don't have a central, meaty entree. Instead they're a balance of tastes, smells, and textures. So don't expect steak, mashed potatoes, and green peas. Since my foot fracture, I've been spending the bulk of my time on horizontal surfaces. I couldn't believe how much I could sleep! I hoped that all the dozing would make my foot heal faster, but no such luck--I was still hobbling around in pain. I asked Mike to go out and fetch the ingredients for the menu I had planned for the evening: Potatoes Baked with Wine and Cream, Tomato Salad with Provolone and Fresh Herbs, and Asparagus Sauteed with Roasted Almonds. Having spent the bulk of his day working on computer virus protection while I was off in La La Land, he wasn't exactly thrilled to be chasing after fresh chives and sliced almonds. But he did it for me anyway, the sweetie pie, and then I set to work. Problem was, dinner was supposed to be at 6:30, and I was only getting started around 6:15. No problem, I thought, we'll eat on New York time, which is anywhere from 8 to 11PM. And that was about how long it was going to take, I discovered, when I glanced down at the recipe for the potatoes and it said they were to bake for 1 1/2 to 2 hours, and then for an additional 20 minutes on top of that! Taking a deep breath, I started on the potato dish first, cutting the medium red bliss potatoes into quarters. Although Edward Espe Brown espouses putting the recipe aside and just being present with the ingredients and how they're coming together, I stuck with the recipe. No way did I want to serve uncooked potatoes or greasy asparagus to my in-laws of just two years. I remember one of the first times Mike and my mother interacted. I was throwing a holiday cookie-making party in my tiny kitchen in Hoboken. My choice of cookie were rollouts, and as I placed the cookie cutter on various corners of the dough, both my mother and my future husband seemed itching to say something. Before I knew it, they had seized the cookie cutter and were stamping away. "You're wasting a lot of dough the way you're doing it," my mother said, "it will take forever if you do it this way. You have to cut them closer together." Mike echoed Mom's sentiment, and also was determined to remove the shapes from the floured surface before I inadvertently tore off a leg or an antler. I was used to my mother hovering over me as I learned to cook, adjusting the flame under pots, adding a pinch more seasoning, securing lids. But now Mike was doing it, too. He had worked in kitchens before, as he's very fond of reminding me, and my mother has cooked dinner for our family almost every night for as long as I can remember. I felt trapped, doomed to the role of prep cook for all eternity because I would never be able to match their collective experience. Back in Maine: As I was putting the potatoes in the oven, there were stirrings in the livingroom about when dinner would be served. I didn't want to tell the truth, but I whispered to Mike's mom, "The potatoes are going to take a while!" I didn't mind waiting--I wanted to taste slow-cooked food the way Edward Espe Brown intended, and would happily drink a glass of wine and munch on cheese in the meantime. But my mother-in-law is practical, extremely capable, and no-nonsense. She intervened, raising the temperature of the oven so the potatoes would cook faster. She told me, "No way is it going to take that long. These are small potatoes. I'll bet they'll be done in 1/2 hour!" Again, it was like too many cooks in the kitchen. Though I knew she was probably right and I should respect her experience, I wanted to follow the recipe as it was written, cook the way I wanted to cook, even if it meant taking the longer path. I cut the tomatoes for the salad and snapped the ends off the asparagus, all the while conscience of the fact that my new family probably thought I was crazy for making a meatless meal that took three hours. By following my mother-in-laws advice, the potatoes were ready in a little over an hour, not two, and we didn't have to eat at midnight. Of course, I couldn't resist reading aloud Edward Espe Brown's commentary on the menu, how it was "a picture painted with flavors." But even I had to laugh when I read "Potatoes baked this way have a marvelous earthiness...the flavor of purified, refined dirt." Hmmm. I hope nothing I ever serve tastes like dirt. My in-laws were very polite and generous even though they were probably wondering where's the beef? For once I felt virtuous eating a meal of vegetables instead of white rice with melted Jack cheese (one of Mike's favorites.) And I felt a sense of accomplishment at turning a bag of produce into a meal. But next time, I'm sending Mike, my in-laws, and my parents to a movie while I lose myself in cooking, Jennifer-style. "We are told from childhood that something is wrong with us, with the world, and with everything that comes along: it's not perfect, it has rough edges, it has a bitter taste, it's too loud, too soft, too sharp, too wishy-washy. We cultivate a sense of trying to make things better because something is bad here, something is a mistake here, something is a problem here. I have a stress fracture in my right foot. Or at least that's what my podiatrist speculates. Mike said the same thing to me when I described my symptoms: sudden pain in the ball of my foot that shoots through my toes and the top of my feet whenever I walk (and sometimes even when I'm stationary.) My foot is tender and swollen and I limp like Laura in The Glass Menagerie. Now I can't take my long walks--at least not for a while. I loved my walks, they got me moving after sitting and typing all day, they made me stop and notice my surroundings, the pretty spring flowers in front of people's brownstones, the med students rushing to the hospital for rounds, the older Black man who asked for change then asked me out, the Irish-looking man in the Red Sox jacket who sold me a "Spare Change" for $1 and called me "kid." I loved walking past the museum, especially the new entrance on Huntington that they just opened. I loved feeling competent and self-sufficient. No waiting for a crowded "T" for me! I would get exercise AND get myself home. But I'm stubborn like my father, I wore cute summer sandals to walk in instead of sensible (read "ugly") shoes. But I had gotten away with this behavior before--why couldn't I again. I miss the feeling of being invincible, of feeling like nothing bad can happen to me, well, because I'm ME. I'll be the exception, isn't that what most people think when they're young? I won't get cellulite like all those other women in their thirties at the beach, exposing the dimpled flesh on the backs of their thighs for anyone to see. Ha! Guess what, I have cellulite on the back of my thighs now, and no amount of activity or snake oil "cellulite cream" has made it go away. I have healthy teeth and gums. I get a checkup every six months, I'll be fine. Ha! Next thing I know, I'm spending four Tuesday mornings in a row prostrate in the periodontist's chair, having needles jabbed in the roof of my mouth and leaving the office drooling blood, my lipstick unevenly applied because half my lip is numb. I can walk in cute shoes! Look at how far I can go! Ha! That first stabbing pain in my foot as I was halfway home Monday night was not a good sign. So many things happen that we thought we could avoid. So many good plans go down the tubes. As we get older, I feel like we lose a little bit and a little bit more. We can't deny any longer that we're fallible. I will have to wear orthotics in my shoes going forward. At first I imagined that meant shopping for the types of shoes nurses and old ladies (and old nurses) wear. I was horrified. But then my doctor explained that orthotics were inserts to balance my tendency to pronate (roll) my foot inward when I walked. I took a deep breath. Then he put this black velcro boot on me and told me I would need to wear this contraption until my foot healed. No end date was mentioned. Did I say that I'm going to Paris next weekend? I'm going to have to hobble around the Louvre and the Picasso museum, stopping to rest for coffee and wine and croissants, before heading for the next sight. Actually, that doesn't sound too bad. I had an image of myself that many women have who have never been to Paris--I will walk the streets in pretty dresses and skirts and cute shoes, and pause in charming bookstores and share coffee with a dark-haired frenchman in a non-touristy cafe. Well, my best friend Alina said I can forget about passing for a French woman ("If I knew how to pass, I would try" she said with a sigh. "They just have that something.") And I'm going to have this boot on so au revoir, cute shoes. And I'm married, so I can't very well sit with an anonymous french man with deep, soulful eyes. No, I will sit at a cafe with my husband who has big beautiful blue eyes and who knows more French than I do. One day I'll learn that my fantasies are just that, and that real life is far more complicated and far more interesting. I think if we consider this quote as it relates to the Internet, it's a nice counterpoint to another post I wrote about the Loneliness of the Internet User. I've been giving myself a crash course on social media so I can figure out how to use it to get the word out about our books and authors. What I'm finding is that it can be beneficial to be a part of a niche group. People are sharing their stories, ideas, opinions, in ways that can reach more people, thereby helping them with whatever their problem is--whether it's what kind of skin cream to avoid or how to treat an eye infection. Sure there are plenty of critics and exhibitionists and liars--but there are also friendly, generous, helpful people on the net. Reading their stories and comments makes me feel less alone. When I was in my late twenties, I went through a period of severe hypochondriasis. It was triggered by some minor health problems that appeared all at the same time, and then fueled by the free-floating anxiety I felt after 9/11. I remember around that time reading an article in O magazine about Michael J. Fox and how he first discovered he had Parkinson's disease when he noticed his thumb kept twitching. The mind is a powerful machine because soon my thumb was twitching, too! I felt pain in my chest, the moles on my back suddenly looked as big as saucers, and my glands were swollen to capacity. I went to several doctors, agonized over what they would find, and read statistics on cancer in young women to either comfort me or to confirm my worst fears, depending on the source. It was a very scary experience at age 28 to think you're about to drop dead at any moment. A trip to San Francisco with Mike that should have been a blast was dampened by my conviction I had Hodgkin's Lymphoma or ALS or whatever other disease I happened to come across in that month's women's magazine. What helped me recover from this form of OCD was A. an excellent therapist and B. an online forum for hypochondriacs like me. The therapist wasn't cheap, but the forum was free. And rather than just sitting in a room once a week talking to a paid professional, on the forum I got to "meet" other people who had similar fears as mine. I was also able to talk freely about my problem--something that at the time I didn't feel comfortable doing with friends or family. 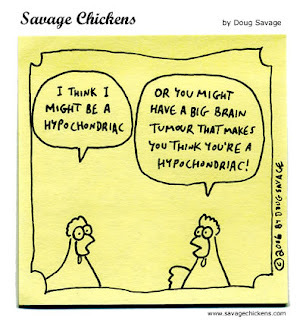 Let's face it--hypochondriacs are often laughed off or just plain misunderstood. If you're thinking rationally, you know that the chances you have breast cancer at 29 are slim to none. Why get all worked up about a yearly exam? But if you've ever experienced health anxiety, you know it's not funny (well, it's kind of funny to me now, but that's only because I'm no longer afraid to touch my armpits because I might find lumps.) It's actually a pretty isolating condition to be a hypochondriac. I even met one of the women from the forum, an artist in her 40's, married with a daughter. She was exhibiting one of her paintings at a gallery in New York and invited me to come to the opening. Although we didn't have much in common besides our health anxiety and an appreciation for art, it was good to see that this healthy, vibrant, attractive woman struggled with the same irrational fears that I did. Shortly after our meeting, I gradually started feeling better, and I visited the forum less and less until I no longer needed it at all. The Internet can be a place where false information spreads, annoymous posters incite flame wars, and shy people avoid the real world. But it can also be a refuge for people who are struggling with something they can't or don't want to talk about with anyone else but their online friends. Used the right way, the web can be a place of healing.